Once again, it’s the weekend, and time for a six sentence (or so, I can’t always count accurately 😉 ) tidbit from one of my works or WIPS. We have a group of talented authors playing, which you can find here on Facebook. 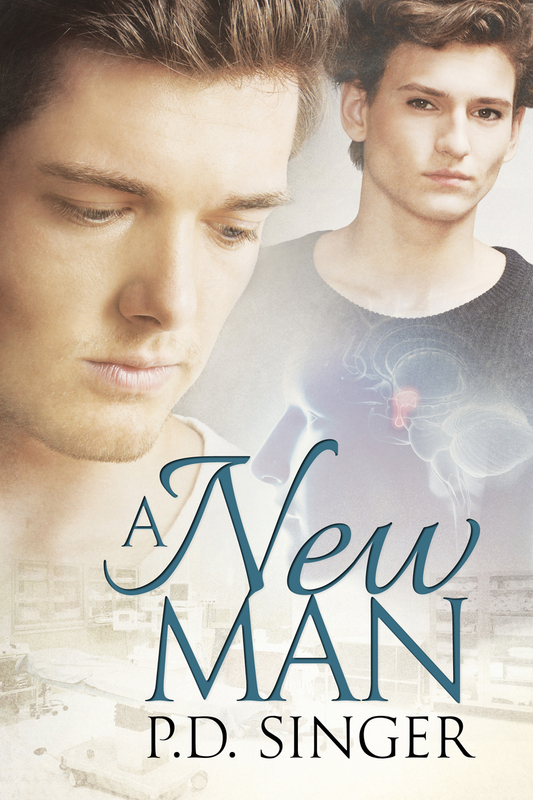 Since I told the story of my colleague (male, nearing retirement) picking up a copy of Spokes, I’ll give you a taste of a professional cyclist and the journalist who falls in love with him without understanding the nuances of his world. Here, it’s their first date: Christopher and Luca were racing their bikes up and down the Pearl Street Mall in Boulder, and warned away by a cop. Luca’s furious: doesn’t this cop know who he is? “Yeah, I said we’d get in trouble.” Christopher tried to soothe the wounded star with, “Look, Luca, I know the Giro and the Vuelta are just as important as the Tour, and I know that Paris-Roubaix is a huge race, and that the Flèche Wallonne is a Classic. And that you won a white jersey there three years ago and what a great honor that is.” Luca would win no more “Best Young Rider” awards; he was twenty-eight now, two years too old to qualify. This is where I have to admit being slightly unclear on the concept. For some reason, last week’s live interview with Tracy of the Mamie Dowd Eisenhower Library was lodged firmly in my head as radio. Or podcast. Something aural. So, I grabbed some books, thinking I could show them to Tracy as we talked and she would be inspired for questions. And I dressed for a radio interview. Very casually. Not in catchy colors. And no makeup. After all, who would see me? I never dress up for work, where I was headed later, so the only person who’d know would be Tracy and an engineer. Wrong. Oh wrong. This was TV. 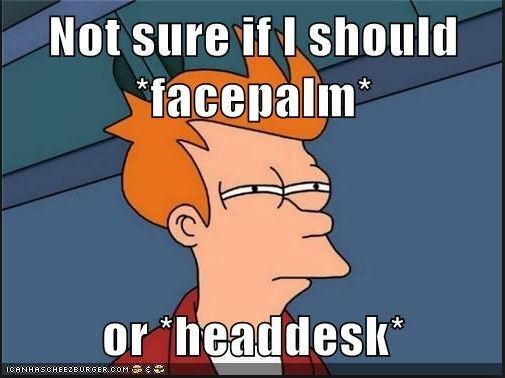 So, about the only thing that went correctly on a visual level was a mass of fluffy blond hair, my trademark, and possibly wilder and fluffier than usual. And the books. I brought Spokes, On Call: the Collection, and Donal agus Jimmy. I’d sold everything else at Pride. 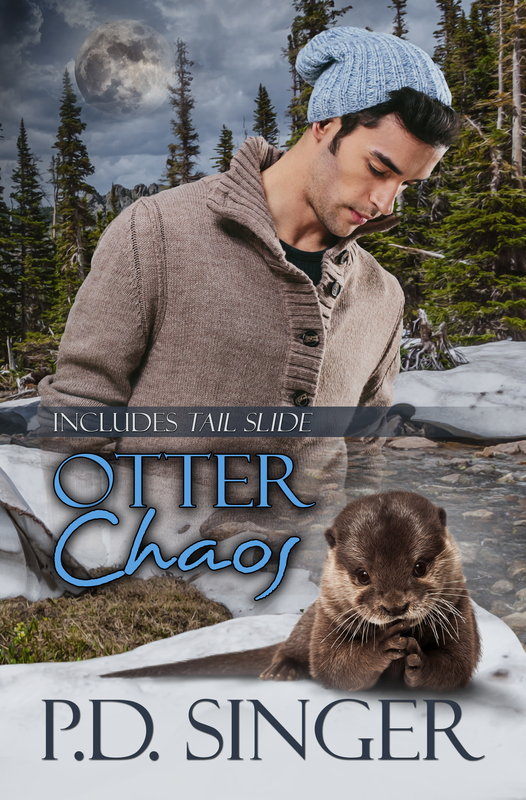 I’d ordered stacks of books from Dreamspinner earlier in the week, but they hadn’t arrived yet, nor had the printer shipped my stock of Otter Chaos. 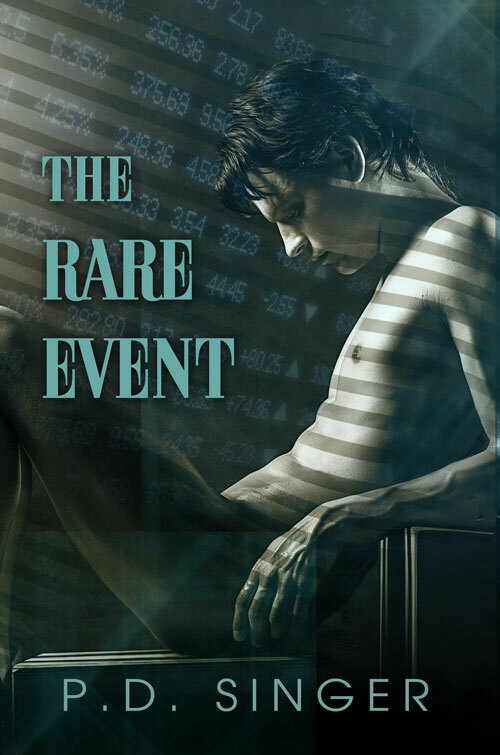 Two of the books, The Rare Event and A New Man, had special ties with this library, since I was inspired to write both by non-fiction I’d picked up there. (They have a rotating display at the top of the stairs, and I read the lower left-hand corner book, no matter what it is. It’s generally interesting.) And I had neither book on hand. So, learn from my error. Keep copies on hand at all times: you never know when you’re going to need them. And put ALL the details on the calendar. The interview will run on local access TV later in the month, and will be available on YouTube. I’ll post links when available so you can all have a giggle at my sartorial distress contrasting with (hopefully) high quality audibles. Also, we have a winner from last week’s “Guess the title” contest. Trix, check your email. I would totally buy that book. Just thought I’d share the results after the 14th Stage of the Giro d’Italia. This cycling race, along with the Tour de France, the Vuelta de Espana, and the Tour of Californa are the big four of stage races, lasting for multiple stages and 2-3 weeks. The pink jersey worn by the overall race leader is analogous to the more famous maille jaune, or yellow jersey we hear so much about in the Tour. In what universe is this road, which leads to the summit of Mt. Crostis, safe to race on? The route varies from year to year, and this leg, which you can’t even watch as a spectator, gets onto the program periodically. 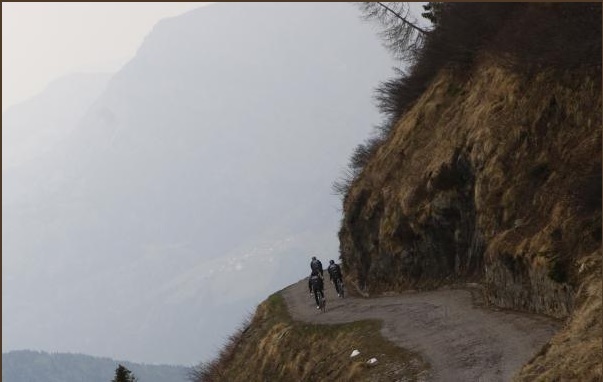 Last time, saner heads, aka cyclists who’d like to survive the race, objected strenuously enough that the route was changed once the stage was under way. The riders found out via ear bug, or by seeing the signs at the fork of the road. Alberto Contador was one of the major voices against riding this leg, and was called horrible names by commentators who apparently can’t tell the difference between a cycling race and gladiatorial games. 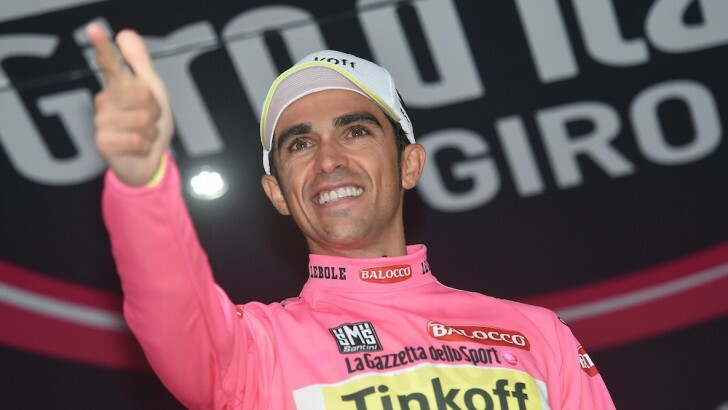 Contador hasn’t won a single stage so far in the Giro, but he doesn’t have to. Stages are often won by specialists: sprinters, climbers, time trialists, and sometimes by rookies with something to prove and who can see past the wiles of the GC (General classification) stars. He just has to finish high enough, often enough, to keep the overall lead. He doesn’t have to be the best at everything, or anything–he just has to be awfully damned good at everything. Contador is. Added bonus (but not a time bonus) for looking good in (or out of) spandex. Contador won the Giro in 2011 but didn’t keep the title, nor any of his palmares from that year. I’m going to wish him all success this year, with clean racing. Because Contador looks fine in pink. The Marital Unit is a distance cyclist who got me interested in the sport. And, as so often happens when I get interested in something, I wrote a book about it. Luca Biondi looks good in pink too.